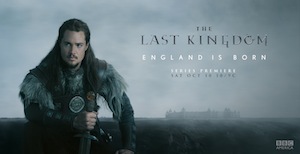 THE LAST KINGDOM — based off the Bernard Cornwell book series, “The Saxon Stories” — will debut on Saturday, October 10th at 10 PM, BBC America announced. “Eleven-year-old Uhtred was born a Saxon in 9th century Northumbria. He watches from a cliff top as invading Danish ships move toward his home, not knowing that his future will soon be turned upside-down. Young Uhtred witnesses his father killed and the Saxon army defeated. That same day he is taken by the Danish warlord, Earl Ragnar. His fellow captive is a feisty, sharp-tongued girl named Brida. The orphans are brought up in the Danish camp. Fast forward and the two have formed a close personal bond as kindred spirits and lovers.